An important part of our work in East Africa is to ensure that every student we work with has a voice to share. To do this, we must first be realistic about the working environments that surround the communities we educate within, both structurally and socially. We believe that in order to encourage the change makers of tomorrow, we must instil confidence in the voices of both men and women and create a fair and competitive environment for them all in which to work. One of the ways that enterprise education helps to do this is by setting students targets to apply their own learning and communicate their ideas to the potential investor. Ms Asha-Rose Migiro – Tanzanian Lawyer & UN HIV / AIDS Special Envoy to the United Nations. Wangari Muta Maathai – Kenyan Founder of the Green Belt Movement. Ory Okollah – Kenyan Entrepreneur of Human Rights and Google’s Policy Manager for Africa. Chimamanda Adichie – Award winning Nigerian writer. Elsie Kanza – Tanzanian. Economic advisor to the President of Tanzania. During the course of our programmes, we found that girls had a strong voice within their team with many electing to take the role of chairperson throughout the day; representing their team to the judges, delegating tasks and leading as well as managing. 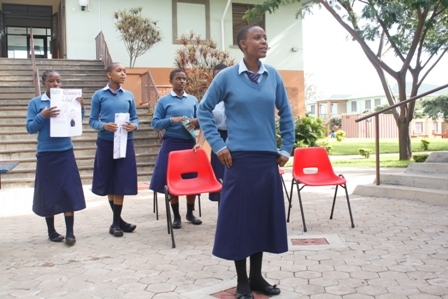 Quoting from the Arusha Times – “Apart from leadership, women can contribute to development of the country in other significant ways; Censuses indicate that there are more women than men in the country and therefore, it is logical to involve the majority of people in productive work, if the country is to make significant progress” (Ramadhani Kupaza, April 2011).